NATO and the U.S. military use the same phonetic alphabet. However, it is widely accepted and used in international radio communications on sea, air, or land. The International Radiotelephony Spelling Alphabet (IRSA) was created by the International Civil Aviation Organization (ICAO) to help decipher similar sounding letters and numbers between different countries and organizations. When on the radio, spoken words from an approved list are substituted for letters. For example, the word "Army" would be "Alfa Romeo Mike Yankee" when spelled in the phonetic alphabet. This practice helps to prevent confusion between similar sounding letters, such as "m" and "n," and to clarify signals communications that may be garbled during transmission. In military missions, the use of the phonetic alphabet has been used to communicate with the chain of command as to what phase of the mission has been successfully performed. For instance, if a SEAL Team has arrived on the beach and were undetected to continue the mission, they may have designated that as the first "waypoint" and use the code word "Alpha." It will tell the upper-level chain of command where they are and if they are on schedule. An early version of the phonetic alphabet appears in the 1913 edition of The Navy Bluejackets’ Manual. Found in the Signals section, it was paired with the Alphabetical Code Flags defined in the International Code. Both the meanings of the flags (the letter which they represent) and their names (which make up the phonetic alphabet) were selected by international agreement. Later editions included the Morse code signal as well. The Navy and other seafaring vessels use the visual symbol on the mast of the ship/boats to convey the status of the ship and crew. From emergencies to dredging operations and other occupations being accomplished by the boat and crew, flags are a way of communicating on the open waterways. As seen in the picture, all flags represent the phonetic alphabet and have meanings different than the above chart. The use of alpha-phonetic symbols is to decrease radio traffic and to communicate status, request assistance, in code that can be internationally understood. 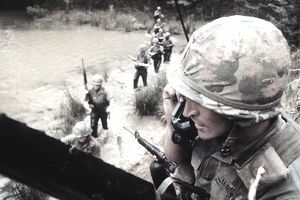 The more tactical use of alpha-phonetics can be used similarly as code words to mission status, encrypted, and decrease open radio traffic with a line of sight communications with flags and lights. Bravo Zulu (BZ) - means good job. Charlie Mike (CM) - means continue mission. Keep moving forward.